Darren Aronofsky’s mother! is disturbing, provocative, frightening, anxiety-inducing, and completely and utterly insane… but it is not a horror movie. Despite being marketed as such, including a poster that very closely resembles the iconic one for Rosemary’s Baby, horror fans will very likely feel screwed over by the time the end credits start rolling. There are certainly scary and disturbing things that happen in this film, but scaring the audience is far from being the first thing on Aronofsky’s mind. This being Aronofsky, the man whose last film featured giant rock monsters in a story about Noah’s Ark, and whose previous film before that was of Natalie Portman having visions of turning into a giant feathered creature whilst occasionally bonking the living daylights out of Mila Kunis, he crosses many boundaries and goes as far out in the imagery and themes as he possibly can, making a film that will leave you shaken to your core but also ensures that you are never bored throughout. 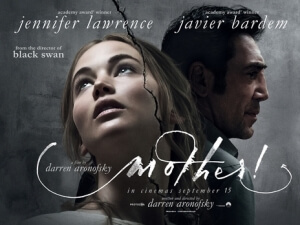 At first, the set-up seems fairly simple: a woman, named only in the credits as “mother” (Jennifer Lawrence), and a man, referred to as “Him” (Javier Bardem), live a tranquil life in a large house in the middle of nowhere, surrounded by nothing but greenery. “Him” is a writer who is suffering from writer’s block, while “mother” is busy decorating their house which was previously burnt down in a fire. Things seem peaceful, until a man (Ed Harris) knocks on their door in the middle of the night. “Him” is oddly welcoming to this complete stranger, while “mother” is understandably on edge, especially when he is offered to stay the night by “Him”. The next day, a woman (Michelle Pfeiffer) arrives, who it turns out is the man’s wife, and they both proceed to make things a little more difficult for “mother” and “Him” with their extended stay. Things escalate quickly, however, when their two sons (real-life brothers Domhnall and Brian Gleeson) show up, and that’s when the entire movie beings to descend into deeper and deeper chaos. Watching this movie, and seeing every single piece of calculated insanity unfold on-screen, is a real experience, almost like riding a particularly intense rollercoaster, one that gives you great pleasure in riding while simultaneously leaves you breathless and completely anxious with the heights that it takes you up and then suddenly drops you from. The camera almost never leaves Lawrence’s side for the entire movie, ensuring that you are seeing this complete and utter madness from the same perspective as her, and feel just as discombobulated and uncomfortable as she does when things go from zero to eleven fast. Tight close-ups on her and other actors’ faces reinforce the claustrophobia of the situation, even further established by the fact that we almost never leave the walls of this house, even as more and more crazy things start to happen. By the end, you will be so out of breath that you’re thankful that the beginning end credits are mostly silent to allow you to get your lungs back in sync after experiencing such an intense and troubling ride, in the best possible sense. Going into this movie completely blind, however, is a double-edged sword; on the one hand, you’re never bored by the giant amount of insane turns this movie takes, and you are extremely curious to know where it is all leading to; but on the other hand, there is so much craziness going on in this movie that it can understandably be hard to even keep track of what Aronofsky’s intentions are with showing us all this madness. It was only after seeing the film that I checked online to see what the movie was indeed going for, and once I found out suddenly a lot of it made far too much sense. It turns out that this is basically “The Bible According To Darren Aronofsky”. Yes, the entire film is one giant allegory for the Book of Genesis, and includes many symbolic gestures to the Garden of Eden, Adam and Eve, Cain and Abel, the Plagues of Ancient Egypt, and even the birth and death of Jesus (as for the identities of Lawrence and Bardem’s characters, there’s a reason why only one of their names is capitalised). Knowing this, and then thinking back on many of the things that this movie just throws at you left and right, all of a sudden makes the experience a bit more rewarding, and makes Aronofksy’s intentions a bit more clear when it so easily could have been lost in the mix of madness. It’s like he looked back on his last film Noah and thought to himself that he could do much crazier things with biblical lore, thus making a film that out-crazies even the Noah’s Ark film that includes giant rock monsters. With that in mind, mother! is perhaps the most insane representation of one of the oldest books in human history ever put on screen, but it is also a mesmerising and thoroughly entertaining ride that will most definitely not be for everyone, but for those who stick with it will be rewarded with some of the wildest footage recorded for a film all year. mother! is an utterly bonkers ride from beginning to end, but the escalating insanity of it all makes for a cautiously entertaining time, even more so when you know the intended allegorical connotations it seeks to make.